Copyright (c) 2007 First Things (February 2007). It is time for evangelicals to recover a fully biblical appreciation of the Blessed Virgin Mary and her role in the history of salvation-and to do so precisely as evangelicals. The question, of course, is how to do that. Can the evangelical reengagement with the wider Christian tradition include a place for Mary? Can we, without forsaking any of the evangelical essentials, including the great solas of the Reformation, echo Elizabeth’s acclamation, “Blessed are you among women, and blessed is the fruit of your womb!” (Luke 1:42), or resonate with the Spirit-filled maid of the Magnificat: “My soul magnifies the Lord, and my spirit rejoices in God my Savior, for he has looked on the humble estate of his servant. For behold, from now on, all generations will call me blessed” (Luke 1:46-48)? “You must know yourself; even though that knowledge serves in no wise to find the truth, at least it serves to help you regulate your life, and there is nothing more appropriate” (Blaise Pascal, Selections from The Thoughts, p 11). ‘O that thou wouldest hide me in the grave, that thou wouldest keep me secret, until thy wrath be past, that thou wouldest appoint me a set time, and remember me! If a man die, shall he live again? all the days of my appointed time will I wait, till my change come. Thou shalt call, and I will answer thee: thou wilt have a desire to the work of thine hands.’-Job xiv. 13-15. “The poetic splendor of the Inferno breaks upon the reader as soon as he opens the first pages of the Comedy; but it is often obscured by historical allusions, astronomical circumlocutions, and terms of mediaeval science or philosophy, which darken and at times quench its light. These obstacles, however, soon begin to yield to patient study, and what threatened to choke the flame catches fire from it and in its turn flings light into every corner of the world in which Dante lived and thought. Meanwhile, earlier or later as the case may be, the reader becomes aware of an underlying purpose and significance, seldom obtruded but always present, that gives unity and direction to the movement of the whole poem, breathing into it a vital spirit of its own and appealing for its interpretation to no other lore than such as knowledge of ourselves and observation of life can give us. Presently, when we grow familiar with the Purgatorio and the Paradiso, the Inferno, in spite of its direct and arresting grip upon our imagination, reveals itself as a beginning that must be read in the light of the middle and the end if we are to understand it truly; and we begin to feel, perhaps gropingly, for the organic relation of the parts to the whole. The misleading suggestion will probably present itself to us, at this point, that the first Cantica of the Comedy is the foundation on which the whole structure stands, and that the way to heaven lies through hell. There is indeed a sense in which this is true, but we can never rightly grasp it till we have realized the deeper sense in which it is false. This is the first point to which we must turn our attention” (P. H. Wickstead, From Vita Nuova to Paradiso p 3-4). “He could not see, he could not feel Him near; and yet it is “My God” that He cries. Thus the Will of Jesus, in the very moment when His faith seems about to yeild, is finally triumphant. It has no feeling now to support it, no beatific vision to absorb it. It stands naked in His soul and tortured, as He stood naked and scourged before Pilate. Pure and simple and surrounded by fire, it declares for God” (C.S. Lewis, An Anthology, p 53). “If anyone should ask: What is certain in life and death–so certain that everything else may be anchored in it? That answer is: The love of Christ. Life teaches us that this is the only true reply. Not people–not even the best and dearest; not science, or philosophy, or art or any other product of human genius. Also not nature, which is so full of profound deception; neither time nor fate….Not even simply “God”; for his wrath has been roused by sin, and how without Christ would we know what to expect from him? Only Christ’s love is certain. We cannot even say God’s love; for that God loves us we also know, ultimately, only through Christ. And even if we did know without Christ that God loved us–love can also be inexorable, and the more noble it is, the more demanding. Only through Christ do we know that God’s love is forgiving. Certain is only that which manifested itself on the cross. What has been said so often and so inadequately is true: The heart of Jesus Christ is the beginning and end of all things” (The Lord p 400). 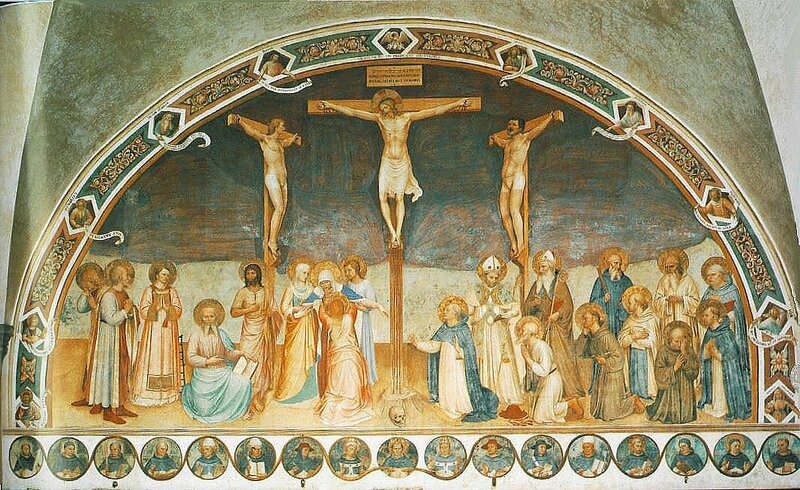 “In the chapter-house of S. Marco at Florence, the artist-saint, Fra Angelico, has painted the patrons of the city and the founds of the great religious orders—dedicated servants of the Eternal Charity—adoring the Crucified who is their Pattern, and from whom their mandate comes. There they are: real human beings of every type, transfigured by a single costly loyalty. There is Mark, the self-effacing writer of the earliest Gospel. There is the Magdalen, completely sanctified by penitence and love. There are the holy women, whose service was of the homeliest kind. There are Cosmo and Damian, the good and honest physicians. There too are the devoted scholars, Jerome, and Augustine; and Benedict, the creator of an ordered life of work and prayer. There are Francis, lost in an ecstasy of loving worship, and Thomas Aquinas gazing at the key to that great Mystery of Being to which he had given his vast intellectual powers. All these—mystics, lovers, teachers, scholars, workers—are linked with the Crucified, the Holy and Self-given, whose agents they are and from whom they draw power and love. The whole range of human accomplishment, in these its chosen representatives, is shown to us in direct and glad dependence on the very-flowing Charity of God. That is the very substance of religion. Like an immense impetus of generosity, it powers out from the Heart of Reality; self-given through generous and adoring spirits of every sort and kind, to rescue and transform the world” (Evelyn Underhill, The School of Charity p 58).